The Delta Sky Club at Seattle-Tacoma International Airport was awarded "North America's Leading Airport Lounge 2019" for the third year in a row by the voters of the 26th annual World Travel Awards. 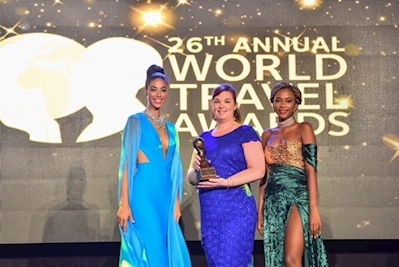 Known for celebrating travel excellence since 1993, the World Travel Awards seeks to "acknowledge, reward and celebrate excellence across all sectors of the global travel and tourism industry" based on an international panel of peers and experts. Asanda Spa Lounge allows guests to depart from stress and arrive at calm. The spa offers options ranging from relieving travel aches and fatigue with a multitude of relaxing massage techniques to a prescription facial according to your skin condition and concerns. "Being recognized by travel industry experts as well as our guests speaks to the enjoyable, unique experience we provide in Seattle," said Claude Roussel, Managing Director - Delta Sky Club. "We're thrilled that for the third year in a row our Delta Sky Club in Seattle is being recognized for its exceptional experience made by our wonderful team and world-class offerings." Delta announced a new Delta Sky Club coming to Austin in Summer 2019 that will feature local brews and bites for guests to enjoy on a covered Sky Deck. Recently, Phoenix opened its first Sky Club featuring regionally inspired food offerings and artwork from Phoenix-based and regional artists. Ronald Reagan Washington Airport (DCA) was upgraded to feature views of the Potomac River with striking lighting, and local chef Marjorie Meek-Bradley's cuisine that can be enjoyed with an exclusive all-American whiskey menu. Delta continues elevating the Delta Sky Club experience as the Club network expands, creating a true destination between destinations. Delta operates more than 150 peak-day departures to more than 50 destinations from its hub at Seattle-Tacoma International Airport. In 2018, Sea-Tac marked a milestone in the construction of the new international arrivals facility by raising and placing the final roof beam in the structure. The 450,000 sq. ft. facility, expected to open in 2020, will be able to serve twice the number of passengers per hour, have over twice the number of passport check positions, utilize enhanced technology for quicker passport check clearance, and simplify baggage claim for customers.